Check out the latest cool pilot stuff! Lots of pilots like to listen in on ATC transmissions when they’re at home or in the hangar, and handheld air band scanners are a great way to do that. But they have their limitations, most notably a lot of dead airtime between transmissions. 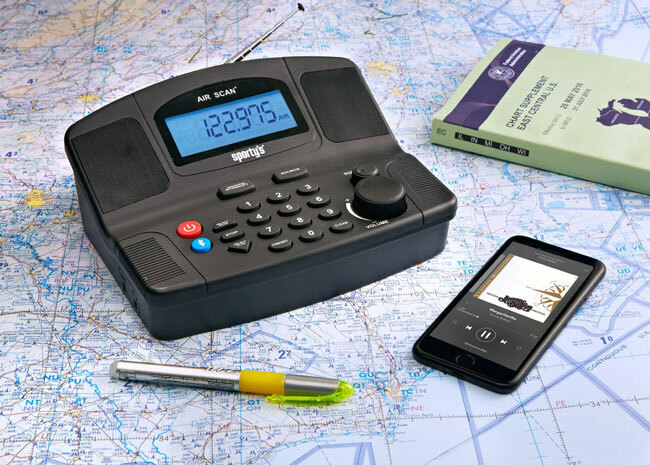 With its ingenious new Air Scan Aviation Radio/Scanner ($139.95), Sporty’s has created a product that fills a number of needs at a really affordable price. The radio is portable and comes with a power adapter. With built-in speakers, it’s also the best-sounding air band radio we’ve heard. The cool part is that you can use it to listen to AM or FM radio. The unit will automatically interrupt that regularly scheduled programing when an aviation call comes in on any one of your 10 programmable frequencies. You can also listen to music or podcasts from your phone through the radio’s Bluetooth receiver, so in essence it’s a powered Bluetooth speaker, too. It also has an aux jack for plugging in a music player if you’re without Bluetooth or prefer your connections hard wired. The Air Scan’s reception is a weak point compared to some handheld air band scanners. Sporty’s acknowledges this and recommends adding a remote antenna to improve the reception if you’re in an area where reception isn’t optimal. You never know what could be growing in your fuel tank—unless you test it, that is. The FUELSTAT resinae PLUS Fuel Testing Kit ($159) lets you check in on the health of your fuel without having to send samples out to a lab. 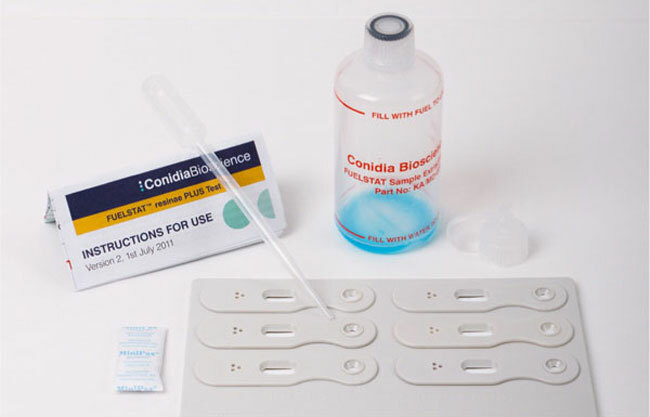 The FUELSTAT testing kit checks for bacteria and fungi contamination, including the Hormoconis resinae fungus, which is known to thrive in aviation fuel. These kinds of contaminants can cause filter blockages, gauging errors and tank corrosion. The fuel testing kit provides rapid screening—showing results in 10 minutes—and only requires a 200 mL sample to work. The test kit comes with a single-use plastic base with six flow devices attached, a preparation bottle, pipette and an instruction sheet. The results are easy to interpret—green for negligible contamination, yellow for moderate and red for heavy contamination. The kit also includes recommendations for procedures to follow if your fuel is contaminated. The idea of using a flight calculator might strike some folks as old-fashioned, but truth be told, unless you’ve got Rain Man-level math talents, it’s handy to be able to quickly figure out what the Fahrenheit-to-Celsius conversion works out to or, for those of us who think about fuel in terms of gallons, how many pounds of Jet-A 242 gallons of the stuff equals. 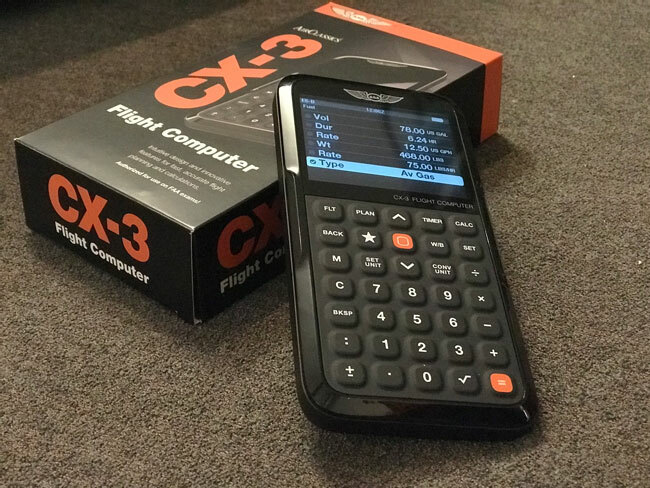 The CX-3 Flight Calculator ($99) from ASA does all that and much, much more, and it does it simply, with very few button pushes and almost no guesswork. Want to know your true airspeed? Punch in the requested values, hit enter and voila. It’ll even give you your Mach speed; for a 182 at cruise, that’s well over Mach .2, if you must know. Some of the calculations the CX-3 will help you make are already automatically done for you on your favorite nav program, but many others aren’t, so this is a super handy tool to have. The unit lets you do weight and balance, convert units, time approaches, plan flights and more. It’s got a bright screen with LARGE characters—thank you—and the buttons are big and easy to push, so even if you’re in turbulence, you’re likely to get the right key every time. The CX-3 is made of sturdy plastic and comes with a clip-on case that’s light and protects against accidental descents to the ramp surface. With winter coming to an end, it’s time to start thinking about how best to thaw out for pilots and their airplanes alike. AOPA’s 2018 Bahamas Pilot Guide ($39.95) offers some helpful planning options for GA pilots heading for warmer weather and lovely getaways in the islands. The guide—which is updated annually—includes maps, in-depth airport data, customs and immigration information, tips on food and lodgings, and much more besides. The newly redesigned Bahamas Pilot Guide is available in both digital and hard copy, so it can travel with you in whatever format best suits your planning style. 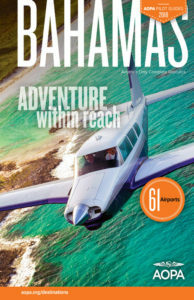 It offers insight into flying the more than 600 islands and cays of the Bahamas. It’s not even that far from the mainland. The islands begin less than 60nm off the coast of Florida. Companion charts are also available for an additional $12.95. For pilots looking for further adventure, AOPA offers a Caribbean guide as well. It’s all too easy to get stuck looking at nothing but your instruments, especially when you’re first learning to fly. 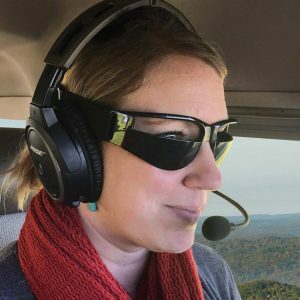 Now, the VFR Training Goggles ($12.95) from Sporty’s provide a quick and uncomplicated way to block out the gauges without having to worry about improvising instrument covers. Like IFR goggles (but in reverse), the VFR Training Goggles work by simply providing a barrier between the eyes and the gauges while leaving the top half of the wearer’s vision unimpeded. The training goggles slip on easily and secure with an adjustable elastic strap, which is designed to fit under a headset. For increased comfort and to make sure they fit properly, the goggles are made of pliable materials that conform to the head. The Garmin GDL 82 ($1,795) is making a strong bid to be one of the cheapest, easiest solutions for ADS-B Out compliance on the market. It also doesn’t require any panel modifications. How does that work? 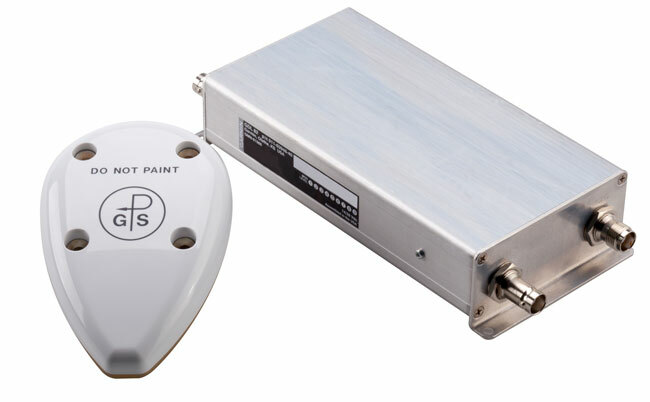 The GDL 82 is a small Universal Access Transceiver (UAT) with built-in WAAS GPS. It integrates directly with the aircraft’s existing transponder and transponder antenna—the GDL 82 is installed along the cable between the two. The unit also has AutoSquawk tech, which touches base with the transponder—it will work with most Mode C GA transponders—to synchronize the squawk codes between the two. No need for a separate UAT control panel. For pilots who already use an ADS-B In receiver, the GDL 82 complements quite a few of the products already available, including the GDL 52, GDL 39/GDL 39 3D and Stratus line. The unit broadcasts on 978 MHz and is good for aircraft flying below 18,000 feet. The purchase price of the GDL 82 includes a WAAS antenna and installation kit. 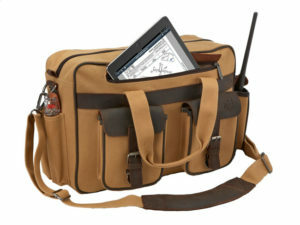 For pilots who want a rugged and great-looking bag, Flight Outfitters’ Bush Pilot bag is just the ticket. But for some pilots, it’s on the large side, and if you’re like us, if there’s room in the bag, we’ll find something to fill the space, whether we need it or not. Enter the Bush Pilot Folio ($139.95), a brand-new, smaller-sized bag that’s built exactly the same way as its full-sized counterpart but with a slimmer profile for easier carrying. The Folio bag is made of heavy-duty canvas with leather accents, including the pocket flaps and buckle straps. It also has a handy sleeve on the side that’ll fit your iPad or Android tablet perfectly. And with two good-sized pockets on the side and a couple more smaller-sized ones in back, it’s still gadget-ready and good to go. Learn more at Flight Outfitters.